Isn’t it frustrating to have a list of emails just to find out that these potential customers are errors. Mistyped emails, a missing letter from an address can truly be frustrating. Tired of all the bouncing emails? Check your email addresses with DataValidation. 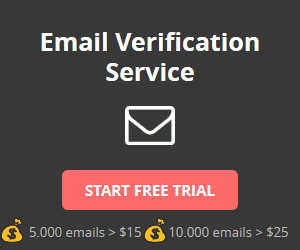 If you’ve had problems with sending emails or looking for an email verification service, you’d want to try DataValidation. They offer free reports, email service providers (ESP) integrations and everyday email monitoring in their remarkably well designed self-service platform. You don’t need to spend hours poring and sifting email addresses, they’ll take care of it for you. DataValidation offers an email assurance service that makes sure that all emails in your lists and incoming ones from your sites are analyzed and synced on a daily basis. This means that all data is processed and updated to make sure that no undeliverable emails get through. If you have an email list that you want to submit, DataValidation can analyze and monitor your list for free! You will receive reports on a list of quality scores and an Email Assurance grade summary. These lists are monitored daily to make sure that new subscribers on your site are being analyzed. You’ll be able to get progress reports on all the needed data over time. DataValidation integrations and API assure that both email marketers and ESPs benefit. The Email Assurance service makes sure that your sites are having a well maintained and updated email list, have successful email deliveries and then synced back to the ESPs list daily. You don’t have to be worried of getting a bounce or an outdated list. They have different pricing guides to suit your marketing needs. They can even offer you a deal if your lists are over 2M! You can get started right away since there are no contracts, no set ups fees charged to users and no credit card requirement.